Egypt's Ministry of Antiquities sent a request on Monday to the country's foreign ministry to prepare a detailed and urgent report about the condition of the Ancient Egyptian artefacts in the National Museum of Brazil, which was virtually destroyed by a massive fire on Sunday. "We feel great sorrow about what happened; it is a great loss for humanity and world heritage," said Mostafa Waziry, the secretary-general of Egypt's Supreme Council of Antiquities, in an official statement issued by the antiquities ministry. Waziry added that the antiquities ministry stands in complete solidarity with the National Museum of Brazil, and that it is ready to make available the needed expertise to restore the ancient artefacts in the museum, if the Brazilian government requests it. Later on Monday, the Egyptian foreign ministry issued a statement saying it was following up on the issue, and had contacted the Egyptian embassy in Brasilia to investigate the current status of the Egyptian artefacts in the Brazilian museum. "The Egyptian ministry of foreign affairs expresses its full support to the Brazilian side, and its readiness to assist, through the antiquities ministry, in providing technical assistance to restore all heritage artefacts of all historic periods if the Brazilian government requires that," the foreign ministry said. A huge fire totally destroyed the 200-year-old museum in Rio de Janeiro on Sunday night. One of the biggest and oldest national museums in South America, it is home to thousands of priceless artefacts, including fossils of the oldest human being ever discovered on the continent. The Egyptian collection includes several hundreds of ancient Egyptian artefacts, making it one of the largest collection of Egyptian artefacts in South America. Meanwhile, the Egyptian National Committee of the International Council of Museums (ICOM EGYPT) issued a statement also expressing its deep sorrow for the disaster and offering its help. 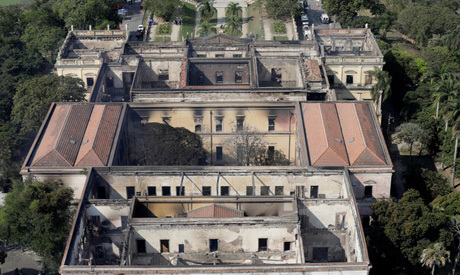 "ICOM and all its affiliates are deeply saddened by the fire which engorged the National Museum Brazil in Rio de Janeiro, which destroyed the museum's collection. This is a terrible happening to human heritage that caused the world to lose a heritage that cannot be compensated of fossils dating back to ancient times, and it is difficult to compensate for the heritage loss, which included items of the Egyptian Pharaonic civilization. ICOM added that it is "in solidarity with the Brazilian Committee in this disaster, and is offering to provide its utmost support for the revival of this museum in affirmation of international solidarity."